There are many characters in this city and Gerry Reilly is one of them with lots of stories to tell. “At 19 years of age I started in this business at the advice of my dad,” said Gerry Reilly, proprietor of Moose Jaw Vacuum & Janitor Supply, located at 310 — 4th Ave. SW (top of the 4th Ave. Bridge). “When I started, I was doing direct selling and I couldn’t sell a thing” he said, “When I got to the fourth week of no sales, I was really encouraged when a lady bought from me.” After approximately 42 years in the business, Reilly has honed his skills and is now a master salesman, through and through. 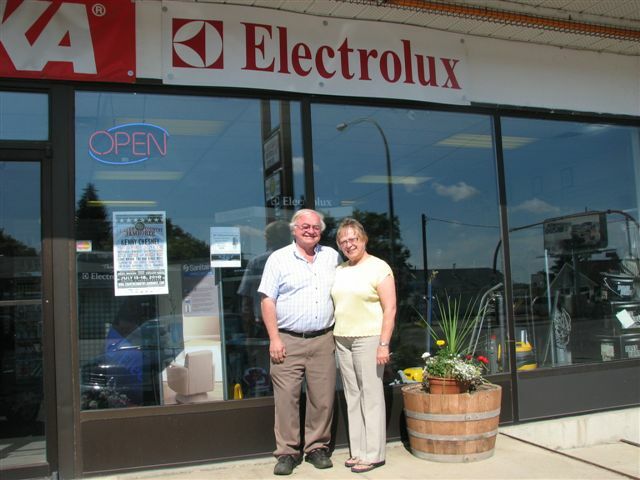 “Once people believe in you and your product,” Gerry admits, “they will follow you wherever you go and buy whatever you sell.” Moose Jaw Vacuum & Janitorial Supply offers a complete line of equipment and supplies- anything and everything that anyone may need in regards to their commercial or residential cleaning needs. Multiple lines of products from vacuums, burnishers. polishers; to chemicals, paper products and cleaning products are available in store. Lines include Electrolux, Dust Bane; the environmental line from Sweden — Nilfisk; Eureka, Carpet Pro, Wet and Dry Commercial Machines and everything in-between. Whether you are a first time buyer or thinking about making an upgrade in your vacuum system, going for a central vacuum or requiring cleaning products, bags, parts or expert advise, Gerry Reilly – [306-692-4677, cell 306-684-5563 or Fax 306-692-1688] is the expert to call at Moose Jaw Vacuum & Janitor Supply The store also offers on site repair and a service depot. Visit us on FACEBOOK to see the current specials! !